When the Jews returned from the Babylonian exile to rebuild Jerusalem, one of their most important tasks was to rebuild the wall, so that the people would find safety in the city. An entire chapter in the Bible is devoted to listing those who helped with the work and where they helped (Nehemiah 3). Within this chapter there is a single blight. It has to do with those from Tekoa. We read that “their nobles would not stoop to serve their Lord” (Nehemiah 3:5). Apparently, the work of rebuilding a wall was too low for them. 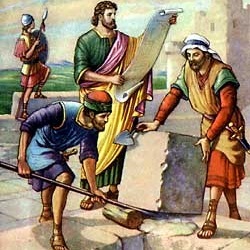 They were not willing to put in the hard labor necessary to help those who were building. This is even more appalling when you read an entire chapter of name after name after name of those who helped out in the work, nearly 50 different people mentioned by name. Among those who helped were goldsmiths, perfumers, city officials, and priests. Some of the women helped, along with the high priest (Nehemiah 3:1, 8, 12, 14, 22). Sadly, these nobles refused to work. Their inaction demonstrated poor leadership. Jesus said, “Whoever wishes to become great among you shall be your servant; and whoever wishes to be first among you shall be slave of all” (Mark 10:43-44). In other words, those who lead should consider themselves to be servants and slaves, ready to lend a helping hand, wherever needed, however low the task. This is the path of good leadership. Remember the word which You commanded Your servant moses, saying, “If you are unfaithful I will scatter you among the peoples; but if you return to Me and keep My commandments and do them, though those of you who have been scattered were in the most remorte part of the heavens, I will gather them from there and will bring them to the place where I have chosed to cause My name to dwell” (Nehemiah 1:8-9). By God’s grace, a remnant of Judah returned to the land under the leadership of Nehemiah. 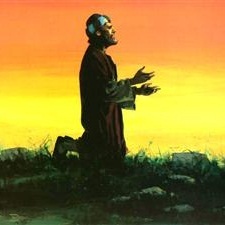 These things ought to teach us to pray in accordance with the promises that He has made to us. Scour the Bible for them and try praying them.